The Camp Dodge Teen Volunteer Trail Program is the perfect leadership development program. Many of our staff Crew Leaders are former teenaged volunteers before coming to work and lead at Camp Dodge. They develop their crew and trail work skills as volunteers and then hone those same skills as leaders in the field. This years class of Teen Trail Crew Leaders is an impressive one, with ample background in volunteering, leading, and trail work...so check out who'll be leading some awesome Trail Crew this summer out of Camp Dodge!! Hi all! Kitty here! I hail from Lexington, MA but I am studying Parks, Recreation, and Tourism at the University of Maine, Orono. This is my third year working for the Appalachian Mountain Club and my first year as the Cardigan Trail Crew Leader. I can’t wait to get back in the woods and meet all of the new volunteers. See you soon! Hey! I am super excited for my second season as a Camp Dodge Teen Volunteer Trail Crew Leader. I am a rising sophomore at Wesleyan University, where I plan to study Environmental Science and Spanish. I am from Newton, MA, and I love to cook, eat, and farm. Can’t wait to meet you! Greetings from Earth. Most call me Jed, and this is my first year working for the AMC as a Camp Dodge Teen Trail Crew Leader. I’m a rising junior at Wesleyan University where I study Environmental Science and Biology. I began serving on the board of the Connecticut Forest and Parks association this year, and have done extensive trail maintenance with that organization. I love playing the banjo, and my favorite color is Fern Green. Hopefully, some day I will go to Iceland, but this dream is yet to come true. Hey, I’m Molly! I just graduated from Massachusetts College of Art and Design with degrees in Illustration and Art History. This is my second year leading trail crews in the White Mountains and I’m so exited! I’m looking forward to lots of trail work, tons of learning, painting heaps of sunsets, and eating gallons of peanut butter. Hi I’m Kate. I grew up on Cape Cod and visited Maine almost every summer. I graduated from Massachusetts College of Liberal Arts with a BA in Music with a minor in Arts Management. 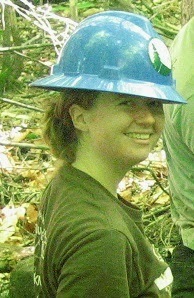 My previous trail work experience has been six months of work during the summer and fall of 2013 with the Maine Conservation Corps through the umbrella program of AmeriCorps. This summer I will be leading teen volunteer crews and its going to be great because Maine is beautiful and I’m excited to be doing yoga in a wondrous setting. Howdy! My name is Nate Wilson and the great outdoors is my passion! I’m 20 years old, grew up in Wayland Massachusetts, and I am entering my third year at the University Maine in Orono ME. Some of my hobbies include backpacking, telemark skiing, rock climbing, fly-fishing, music, and art. I was a previous volunteer on the two and four week crews and I’m wicked stoked to share some great experiences with you all this summer! Hi there! My name is Allison, and I am very excited to be returning for my second year leading trail crews at Camp Dodge. I just finished my second year at Brown University, where I am concentrating in geochemistry. I can’t wait to get back on the trails this summer and meet all of the volunteers! Hello! I’m Greg and I am back to lead crews after a one season hiatus. In my other life I attend the University of Michigan and study Aerospace Engineering where I am also pursuing a commission in the US Air Force. I am super pumped to trade my ruler and calculator for my boots and axe and get out on the trails! Hola - I'm Izzy Pezzulo! I hail from sunny and tropical Florida, but I’m fortunate enough to have spent the last couple summers as a trail crew volunteer in Maine and The Whites. I will be attending the University of Richmond in the fall to study art and science. This is my first year as a Camp Dodge Teen Trail Crew Leader, but I’ve had some of the most exciting and challenging experiences of my life here at Camp Dodge. I’m psyched to hit the trail this summer with amazing work crews to share some trail magic over the season. Salut! Oui, je suis de France. I'm Jerome and I’ve been living in the US for the past 18 years. I’ve worked for the AMC for several seasons in different capacities and this summer I will be in Maine leading trips. Let’s go outside, build trails, rediscover our natural environment and have fun.